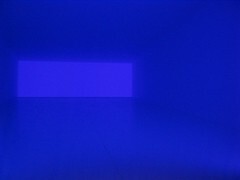 This summer there is a James Turrell exhibition at the Museum of Fine Arts, Houston, which is referred to as an installation. In the past I have always shied away from things calling themselves ‘installations’ as it felt a bit pretentious. For example, I admire the patience and effort it took Ai Wei Wei to create all those ceramic sunflower seeds, but scattering them all over the Turbine Hall at the Tate Modern felt a bit pointless. Perhaps I should have gone to see it and then I would have understood. Having visited the Unwoven Light installation at the Rice gallery a few weeks ago, I decided to venture into a second installation. In part because the marketing material has a beautiful blue image on it and I decided that if nothing else I could stand in front of this image and relish the blue. I asked my friends if anyone wanted to join me and in the end there was a group of eight of us who all gained free-Thursday entry (sponsored by an oil company – funny that in Houston!) last week. There are seven rooms in the Houston installation containing one artwork each. Some of the rooms are relatively small and only up to four people can enter them at a time. Our group of eight split into different groups of four for each of the rooms and in light of our discussions of each piece of art I am glad we were amongst friends. Not that anything inappropriate was being said, rather we didn’t adhere to the customary hushed tones of museum visitors and knelt on the floor to peer at art from different angles. 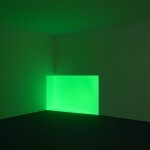 As the title suggests, James Turrell uses light as his art medium. 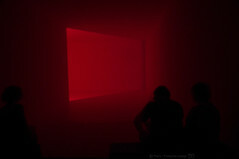 On entering the first room, it appeared as if blue light was being projected into the far corner of the room to give the impression of a rectangular box of light. I was intrigued by what shape was being used to beam the light through to create that impression, turned around to look behind me and couldn’t find the projector. When I pointed this out to the others they also looked around and we struggled for a while to work out how this box of blue light was being created. We eventually worked it out, although I won’t ruin it for others. Our visits into each of the rooms then became a joint endeavour of admiring the light illusion, solving the riddle of how it had been created and then re-admiring how James Turrell had even thought of the outcome to then proceed to designing and engineering each piece of art. The exhibition includes a number of Projections, one Wedgework, a Tall Glass room and a Ganzfeld. There was quite a queue to get into the Ganzfeld and although I was not completely sure it would be worth it, I decided to stand in line. I am very glad I did. Being immersed in a room filled with a coloured light, which subtly changes tone over time is a peculiar sensation and a demonstration of the marvels of the human body and brain. You can see out of the Ganzfeld and having waited to enter it, I knew the light outside did not change. However with the colours inside changing it did look as if the light outside was changing in sync just by the opposing hue. While we were discussing the shades and the effect they had on the colours of our clothes, I said ‘it feels pink’. One of my friends responded ‘you said it feels pink rather than looks pink’. And honestly, being enveloped in the colour it did feel more than look pink. Overcoming my prejudice against installations has been very worthwhile. I just hope that future art installations leave me as awed and in wonder as these two have. had the good fortune to work at a gallery where we put up a Turrell exhibit (Fritto Misto). Was an experience which never dimmed (so to speak). There is something profoundly physical about his works which is deeply moving. Difficult to put into words without sounding trite or dipsy. You’ve managed it – top review.